BUILT-IN METATARSAL SUPPORT: The design of the Pinnacle PLUS allows for spreading and cushioning of metatarsal heads for pain relief. 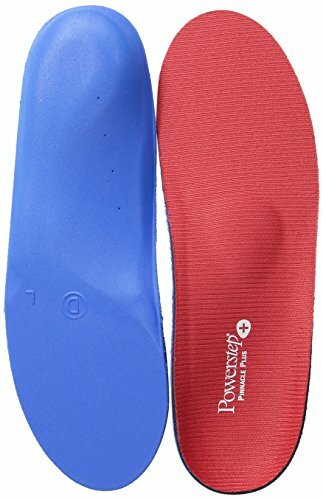 SEMI-RIGID ARCH SUPPORT: Arch support and heel cradle increase support, stability, and help relieve heel and arch pain, while providing extra padding for the balls of your feet. DUAL-LAYER CUSHIONING: Durable EVA foam base and Variable Cushioning Technology provide long lasting comfort and targeted cushioning with a soft, supportive feel. ANTI-MICROBIAL TOP FABRIC: Heat and friction are reduced, providing added comfort and improving foot health. NO TRIMMING REQUIRED: Move the Pinnacle PLUS from shoe to shoe without having to cut the insole to fit - allowing for metatarsal support and padding in each of your everyday shoes. If you have any questions about this product by Powerstep, contact us by completing and submitting the form below. If you are looking for a specif part number, please include it with your message.